Are you familiar with dog distemper symptoms? If your dog has a runny nose and diarrhea or if your dog has eye discharge and is not eating, she may be in trouble. If your pet hasn't been vaccinated, this is information you really need to know. The canine distemper virus is a highly contagious disease that attacks a dog's main body systems, including the respiratory tract, the gastrointestinal system and even the central nervous system. As you can imagine, such an attack is devastating, and many infected dogs die from the illness. To date, there is no cure for the distemper virus. It simply has to run it's course to the end. This virus is airborne, and most typically spread via an infected animal's breath, sneezes, saliva and eye secretions. It can also be shed in the animal's urine and droppings. If the animal is fortunate enough to recover, it will still continue to shed the virus for several weeks after the symptoms have subsided, but this will eventually end. The initial onset of symptoms occurs about ten days after a dog first contracts the distemper virus. During this time the virus is incubated in the lymphatic system, and from there it makes its way into the blood stream where it is circulated throughout the entire body. Finally, the virus makes its way into the linings of the digestive, respiratory and central nervous systems. This is when symptoms of illness become noticeable. A dog will typically display at least some of the dog distemper symptoms listed below. It is not necessary to display all of them in order to have the virus, and which symptoms appear has a lot to do with which areas of the body are most affected. Fever: Normal dog temperature ranges 100 to 101 degrees F. Fever caused by distemper will spike to 103 F or higher. The fever may come and go, so sometimes it goes unnoticed in the beginning. Lethargy: The dog will seem depressed and reluctant to move. Nasal discharge: A runny nose is one of the earliest signs of infection. Watery eyes: Inflamed, runny eyes quickly become matted with mucous as the infection takes hold. Heavy breathing: If the dog has a runny nose and panting, this is a sign that the lungs are affected. Coughing: Coughing could indicate pneumonia is developing in the lungs. Vomiting: This is a sign the virus is attacking the gastrointestinal system. Diarrhea: Bouts of diarrhea are further signs of the virus in the gastrointestinal tract. Lack of muscle control: This presents as general clumsiness that deteriorates into spasm or seizures and various degrees of paralysis. Loss of motor skills: This is consistent with the lack of muscle control, and is a sign the virus is attacking the brain. Confusion: This is further sign of the virus' presence in the brain. Blindness: Loss of sight appears in the late stages of the disease. While your dog's immune system is engaged fighting the distemper virus, secondary bacterial infections have the opportunity to invade and make your dog even sicker. The signs of these infections are often the same as those caused by the distemper virus, but they cause those symptoms to increase in severity. Generally, you should watch for a dramatic increase in mucous secretions from the nose and eyes, as well as very labored breathing. You may also notice bloody mucous in the diarrhea. First and foremost, the best way to help your dog avoid contracting canine distemper is to have him vaccinated according to your vet's recommendations. Distemper has no cure, so prevention is crucial. In the event that your dog does contract the distemper virus, you need to seek veterinary care as soon as the symptoms become apparent. Your vet will assess your dog's condition, attempt to identify the virus, and offer supportive care. 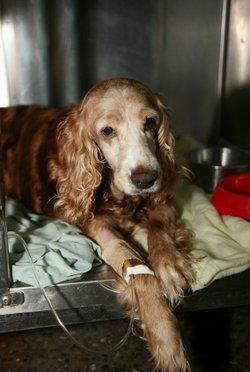 This can include administering IV fluids and antibiotics for secondary infections. The treatment is designed to help sustain your dog as his immune system goes to battle against the invading organisms. The outcome of the situation mainly depends on your dog's own strength.